Not many people can say, with certainty, that they have had a life-changing experience. I can. The Stroud Historical Society was preparing lunch for a busload of tourists. The secretary Bubbles Rowe and myself were busily engaged making sandwiches in the Stroud School of Arts kitchen. ‘Your father used to screen the pictures in Stroud didn’t he Beryl?’ she asked. I looked up from buttering a slice of bread and said. She placed a piece of ham between two slices of bread and replied, ‘I received a letter yesterday from the Sydney University. A Group of people propose holding a conference to commemorate ‘a hundred years of movies in Australia’. ‘Well, why are they writing to us?’ I asked. My only attempts at anything literary were the compositions I wrote at school and I didn’t think they would rate as University material. I hesitated to commit myself but spurred on by Bubbles, I did agree to put some thoughts on paper. Once started, the memories came flooding back and it was apparent that my recall of those days was still quite clear. Happily, I delved into the past and found that remembering and recording it very rewarding. The first draft was a hand-written scribble that only I could understand-the second was laboriously typed with two fingers. When finally it was finished to my satisfaction, I posted it-and forgot about it. Imagine my surprise when I received a letter from a Professor Ross Thorne praising my effort and requesting that it be part of the planned event-also asking that I present it at the Sydney University during the conference. Naturally, that episode hadn’t instilled me with confidence and the mere thought of speaking at Sydney University made me feel sick in the stomach. Our daughter Anne came up with a solution. ‘I’m sure you will be able to do it Mum but, on the day, if you feel you can’t, I’ll do it for you. ‘She said. In my reply to Professor Thorne I expressed delight at having my submission accepted and that myself- or a substitute family member- would be happy to present it on the day. Son Tony suggested that if I put the brakes on their wheel chairs, I would be sure of a ‘captive’ audience! I did accept the offer to present my little talk at the Community Lodge and though nervous at first I soon felt much more at ease. My audience was a sympathetic one; most of them had known me since I was young and they remembered going to Dad’s pictures. Surprisingly, all went well and I actually found that I was quite relaxed; but of course, it was the Stroud Lodge and not the Sydney University! 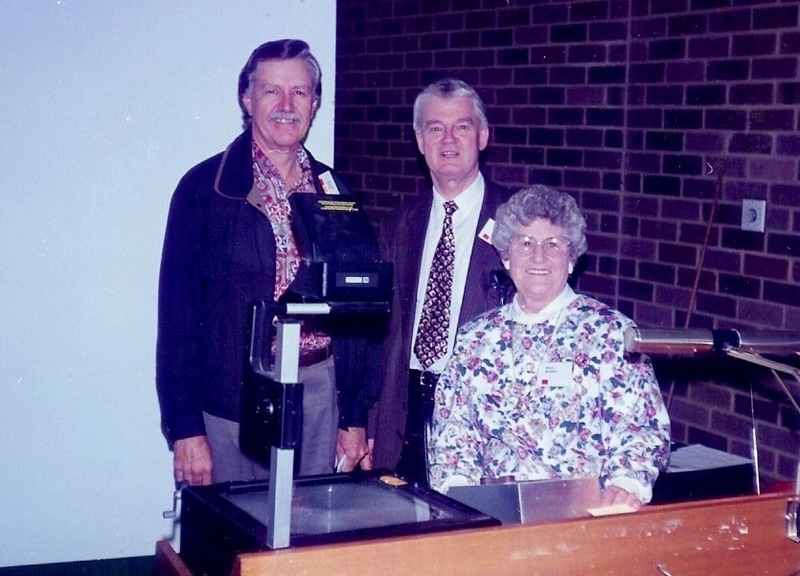 My husband Lloyd, Anne and myself travelled down to Sydney by train the day before the conference. Tony and our other daughter Lyndell came by car the next day. We had a few anxious moments waiting for them to arrive- but they made it on time. The Going To The Pictures Conference commenced on Monday 26th June 1995 and continued for four days. I was scheduled to speak before lunch on the first day. I have no memory of the previous speakers. When my turn came I walked down to the lectern on what were surprisingly steady legs …under the circumstances. Professor Thorne was waiting to put my mike on and to familiarise me with the slide machine. I was to be assisted by a few well-chosen slides of Stroud. After introducing me and seeing that I was comfortably seated-he left. I was on my own! This should have been the signal for my nerves to kick in, but they didn’t. I felt quite composed. Before commencing, I remember looking round and thinking, ‘Well Beryl, it’s true; you will be seventy on Saturday; you left school at fourteen; and here you are seated in a lecture room at Sydney University; about to present a paper that you have written, to a room full of people’. I should have been as nervous as ‘billio’, but I wasn’t…I felt perfectly calm and extremely confident. To say that I had them” in the palm of my hand” is no exaggeration. That is exactly what happened. An immediate rapport was established between the audience and myself. Their spontaneous participation was overwhelming. They were loving it, and so was I! Encouraged by the warmth of their response I deviated from my text and threw in a few “funnies”. I said ’that I have a tendency to hyperventilate under stress, so if I started gasping for air they would know what the problem was. Told that to breathe one’s own oxygen is beneficial, I had Lloyd standing by with a paper bag to put over my head, should the need arise’. Fortunately, it was not needed, but I did get a good laugh! I thoroughly enjoyed every minute of the whole experience and was sorry when it was over. My University “lecture” had proved a resounding success. The sustained applause that followed, stopped just short of a standing ovation. Question time became such an animated discussion that Professor Thorne was obliged to call a halt, as there was to be another speaker before lunch. When the mike was removed I stood and bowed to the audience. More applause followed as I virtually floated up the steps and resumed my seat among my beaming family. Lunch consisted of sandwiches and a cup of tea. While appreciating the unique experience of being the centre of attention, I found it had its drawbacks. I couldn’t manage a sip of tea or a bite of sandwich because of the congratulatory hand shaking and backslapping. My family stood back, enjoying the adulation I was getting…and the food that I was not! They did save me a couple of sandwiches that I ate in the car on the way home. This pleased me, as it reinforced my own feeling at the time, that my presentation not only FELT good; it WAS good. The whole –hearted response I received that day changed me from a self-conscious wimp, reluctant to be placed in any public situation, to an extrovert who now relishes being in the limelight. My recent comedic concert appearances bear that out. I have spoken in public on numerous occasions since and my efforts have been well received though, like the man said, I do like to be well prepared. By the way, I am back on the reading roster at St Johns Church. That day at the Conference was, for me, a personal triumph…and the best part was my family were there to share it. It is now nineteen years after the event. I have received from Ross Thorne a complimentary copy of a publication called PEOPLE AND PHYSICAL ENVIRONMENT RESEARCH, which contains information relating to the early days of movies in Australia. Gratifying to me was; that of sixty submissions presented at the conference, mine was one of nine chosen to be published. I am told that the book will be placed in Universities, libraries and other places of learning as a reference for the benefit of students of that genre. To think that something I have written will be studied by academics is mind-blowing. What a wonderful compliment; I couldn’t be more pleased! Thank you Kevin, it is a time to remember.